Pomegranates have been cultivated since ages in Iran and then spread to the Himalayan range, in North India and China. Today it is cultivated widely in Asia, Europe, Africa, Russia, USA and some countries of the Middle East. In the USA, they are mostly grown in California. Pomegranates are sweet, tangy-to-sour fruit with the seed being enclosed in a translucent, watery covering called the aril. The color of the aril varies from white, pink, red to purple. 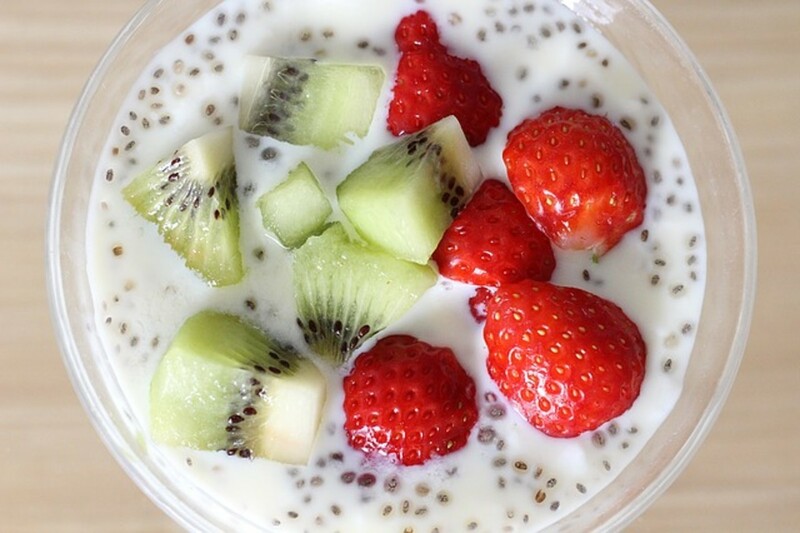 Each fruit has hundreds of seeds in it. Pomegranate juice has a little tartness to it. Pomegranates can be stored up to a month in a refrigerator and for a week, in a cool dark place. All parts of the pomegranate fruit has nutritional factors beneficial to human health. The peel of pomegranate is almost one half the weight of the whole fruit. It contains flavonoids, phenolic compounds, a variety of tannins, minerals potassium, sodium, calcium, phosphorus, magnesium and complex poly saccharides. The edible part, which is 50% of the total fruit weight, contains 10% seeds and 40% arils. 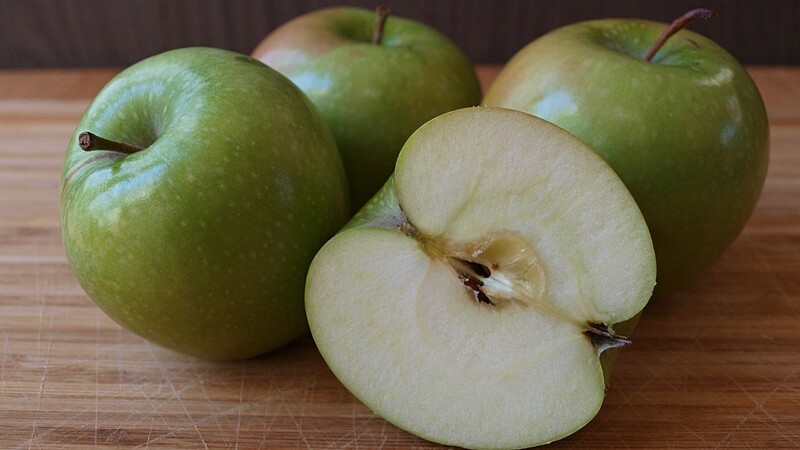 Arils have about 85% water, 10% sugars mainly fructose and glucose, about 1.5% pectin, some organic acids, flavonoids, phenolic compounds and some tannins. The seeds are rich in lipids, of which, the oil component is about 12% to 20%. Seeds also contain many poly unsaturated fatty acids, protein, fiber, vitamins, minerals, sugars, pectin, poly phenols, isoflavines, and the hormone estrone. It is known today that the positive health properties of pomegranate are due to the presence of bio active compounds like flavonoids, phenolic acids and tannins contained in it. As pomegranate is rich in dietary fiber both soluble and insoluble, it helps in improving digestion and regulating bowel movement. It has no calories or saturated fat and is recommended in weight reduction and cholesterol controlling diets. 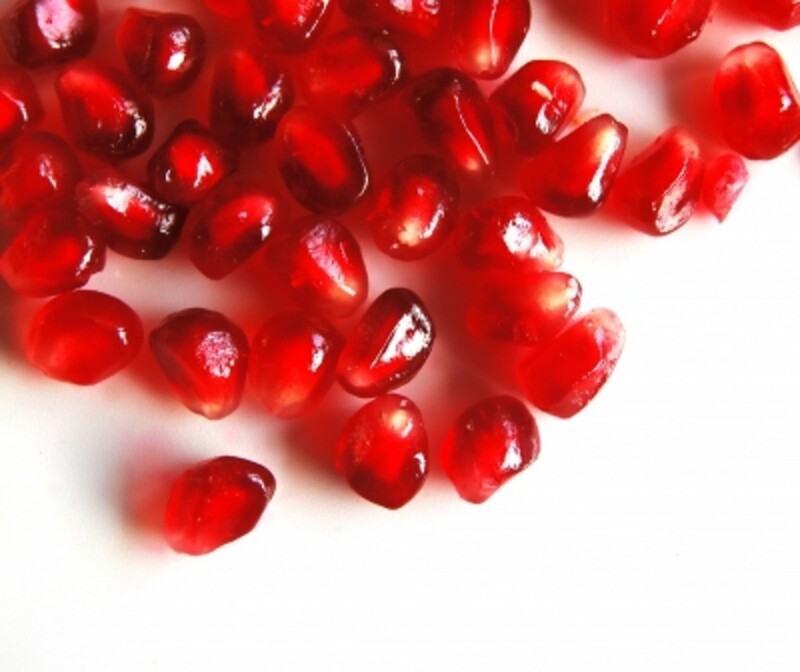 The anti oxidant, punicalagin, is abundant in pomegranates. This, along with the tannins found in this fruit, may help in reducing incidences of heart disease including atherosclerosis, the narrowing of arteries caused by plaque due to high fat and cholesterol in diet. The high Vitamin content develops resistance and immunity to diseases. Regular consumption of pomegranate is found to be effective against prostate cancer, diabetes and lymphoma disease. 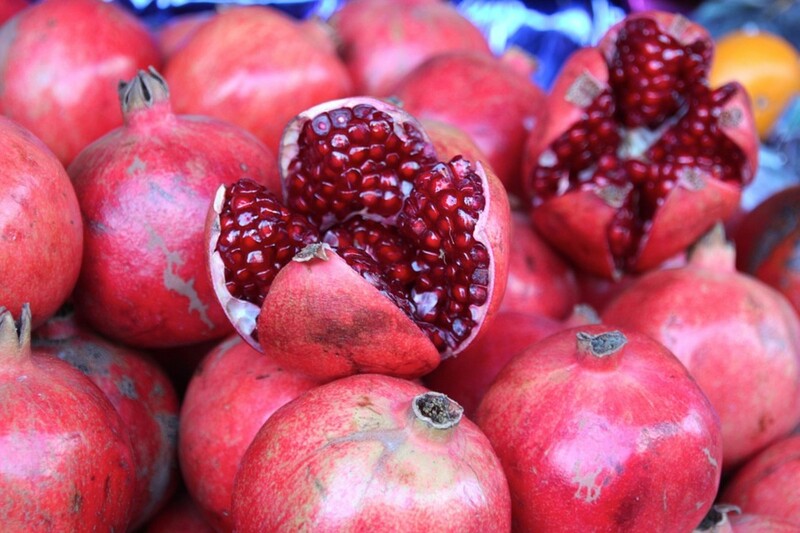 Pomegranate juice has been a popular drink in Iran, India, USA and Canada. Pomegranate seeds are used as spice (called Anardana) in Indian and Pakistani cuisine. The seeds are also used in making curry and chutney. The dried arils are used in granola bars and fresh pomegranate as salad toppings, in yogurt and ice cream. Pomegranate jams, jellies, molasses, martinis and wine is available too. A sauce made from pomegranate juice is used as salad dressing and to marinate meat. Pomegranate is used in Ayurvedic medicines for thousands of years. 17 months ago from From Mumbai, presently in Jalandhar,INDIA. Cajun I have not tried it so cannot comment. Sorry! Can a quartered unpeeled pomegranate be used in a juicer? Thanks for the added info on drying the skins. L.L., the skins are dried in the shade. I'm glad you like the info. Thanks for sharing. Pomegranates are so refreshing to eat, I find. Have you dried the pomegranate skins, Rajan Jolly? If so, what method did you use? @ Saloca - Glad you find the info useful. Thanks. @ jtrader - thanks for reading. @ NVB - Glad you like the info. @ SINewsome - Fresh pomegranate skins can be juiced manually. Thanks for stopping by. Can you juice the skin of a pomegranate? I know that a lot of antioxidants are in the rinds of many fruits. Inspiring! I have a pomegranate waiting in my kitchen! I've always enjoyed this fruit. I don't see as many trees around now. Nice to meet a like minded hubber and will be following you too. Thanks for appreciating the info and for the following. Appreciate the visit. Great article. I love pomegranates. They are great to add to citrus-based salads too. Being healthy is one of my niches in hub-writing. Nice to see a fellow hubber writing with health in mind! Will follow! Tim, seedless pomegranates are available too! you could start with those. Thanks for sharing this! It encourages me to try pomegranates but I really don't like eating the seeds - any suggestions? Thanks for sharing this useful information Anshu. Thanks sparkleyfinger. I'm glad you found it useful. Great hub, plenty of useful information in there! Thanks for taking the time to put it together! Thank you megafunhouse. Appreciate the visit. @ FreezeFrame - thanks for appreciating it so much. @ ITcoach - I'm glad you like these healthy food hubs. Appreciate the sharing and support. @ Joyette - I'm glad you have the info now. Maybe you can benefit with more pomegranate use. Thanks for being here. I have a pomegranate tree in my yard, but I have never used the fruit. I had no idea that it had so many heath benefits. Thanks for sharing this the information. Thanks for another awesome hub. Almost all of your hubs are a masterpiece of hard work. I cannot imagine such a nice piece of work. Thanks for sharing another healthy and delicious hub. Nice information... infect health is more valuable for a human. Great informative hub! I want to run to the store and buy pomegranates right now! @ TattooKitty - Thanks for stopping by. @ Alecia - Thanks for your input and visit. @ Hezekiah - Glad you found the info useful. @ Vicky - thanks for your continued support. love your posts as usual! Never knew pomegranates were so good for you! I haven't had one since I was a kid. 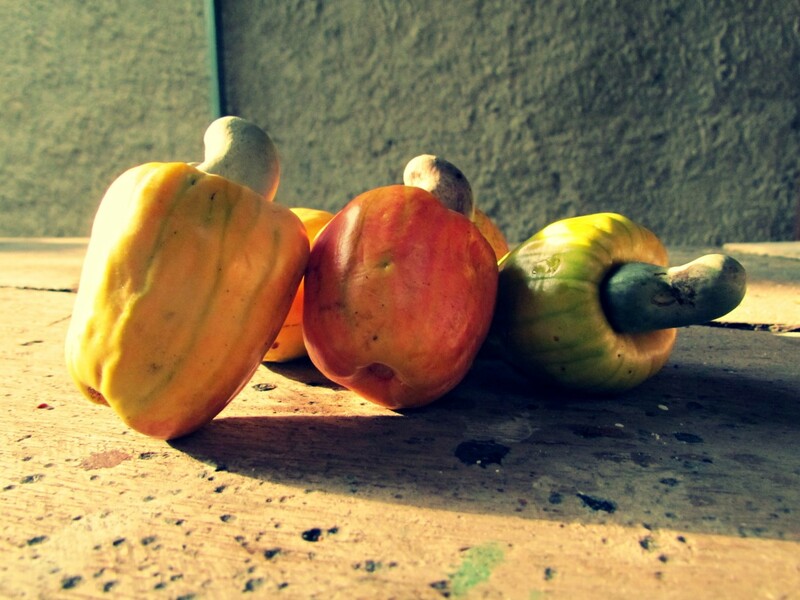 Great Hub, they are not so easy to eat, however taste nice. I didn't know about the nutritional value in them. Pomegranates are awesome. I just love how they taste but finding out how healthy they are makes me love them even more. This is some great information! Excellent article about the benefits of pomegranate. I've been quite intrigued and delighted with the fruit ever since reading the Persephone myth. Such a seductive and rich quality to its taste...love it!! Thank you for teaching me about this fantastic fruit. Voted up! @ Gail Meyers - Thanks for reading and appreciating. I hope you are motivated enough to give them a try. @ Rick jones - Thanks for sparing time to read and comment. @ Maximizer - Thanks for visiting. Great info. Thanks a lot for sharing this! Great hub! I have never really enjoyed pomegranates. They are just not something I grew up eating, but I'm going to start. I just keep reading about the health benefits. Bookmarked and voted up! Thanks for your input, lfolk. Thanks for reading and commenting. Fantastic article! 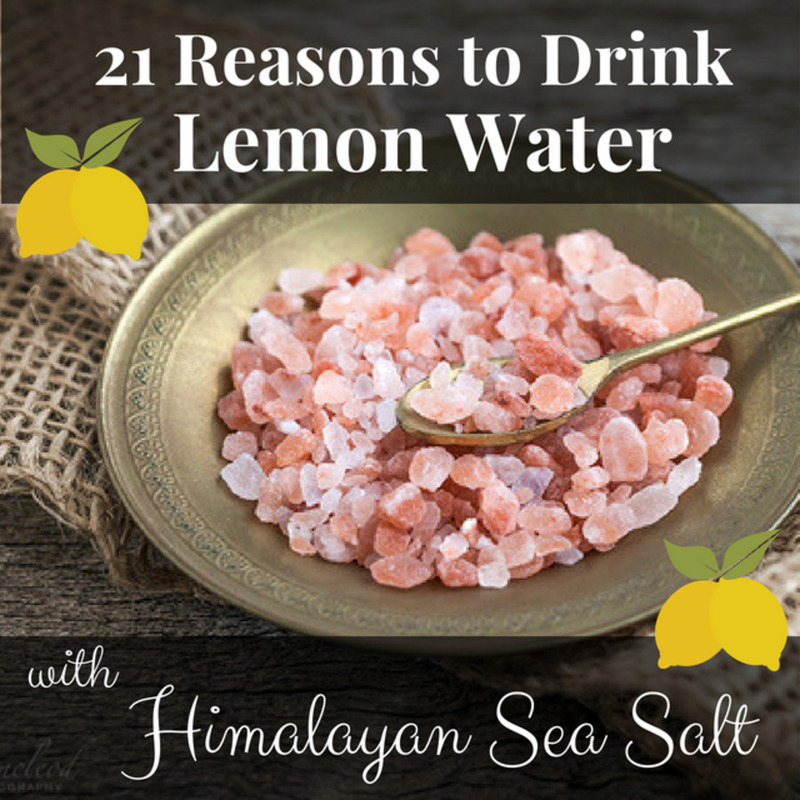 I use the concentrate with water and it has helped lower my blood sugar! KDuBarry, glad you liked it enough to bookmark. Thanks for voting and sharing. Wow, Rajan, I'm happy I drink pomegranate juice everyday! Thanks for sharing this great information, I have to bookmark this. Voted up and shared on facebook! What a coincidence Denise! Thanks for reading and leaving your feedback and votes. To be honest, it's hard to tell. I've started a new medication in that timeframe as well as trying acupuncture. It's hard to know what caused what. In any case, the suggestions all lead to better health and so I'm sure they have helped me to feel at least a little better. Thanks for your concern. ar.colton, it's been 2 months since then. Is there some sort of benefit? I mean even a wee bit is a pointer to the effectiveness. I wish and pray that all these suggestions work for you. Do let me know. Thanks for the link Rajan. I've heard of (and implemented) most of the suggestions on that page but there were a few that were new to me. Definitely giving them a try! Thanks for stopping by, Brett. I hope your partner benefits by this hub. I appreciate your good words. Well written and interesting hub. I actually ended up reading it as my partner text me 'how do you eat pomegranates!? They are really fiddly.' ... this should give her a few ideas and reasons to persevere lol. Thanks for stopping by HendrikDB and leaving your comment. This is a childhood fruit of mine. Loved it. Now i will enjoy it for its health benefits. Thanks. Injured lamb, I am happy to note that my hub has been of benefit to you. I appreciate your stopping by and leaving your comments. @ AmnNoE, welcome to a new reader. Thanks for stopping by. @ MsDora, Thanks for reading,sharing and voting. @ ar.cotton, welcome to you too.Sorry to learn about your health condition. Thanks for stopping by, appreciating and voting it up. Extra oxygen intake by way of deep breathing has been demonstrated to remove a lot of physical problems due to the removal of accumulated toxins. Deep breathing for 2 minutes twice a day would give the body cells an extra dose of oxygen. Below is a link on home remedies for fibromyalgia. I hope it helps. Rajan this is a great hub! I love pomegranates for the taste but have also been eating them for their medicinal properties. 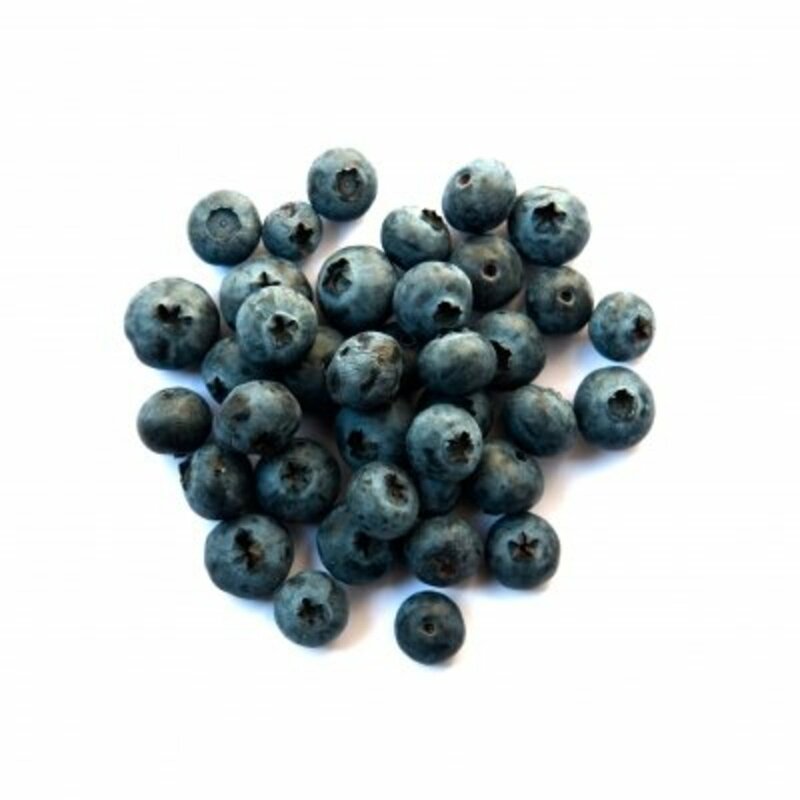 I have fibromyalgia and have read that anti-oxidant rich foods can aid in getting oxygen into the muscles. I can't be 100% sure that it helps but I know it's good for me so why not? 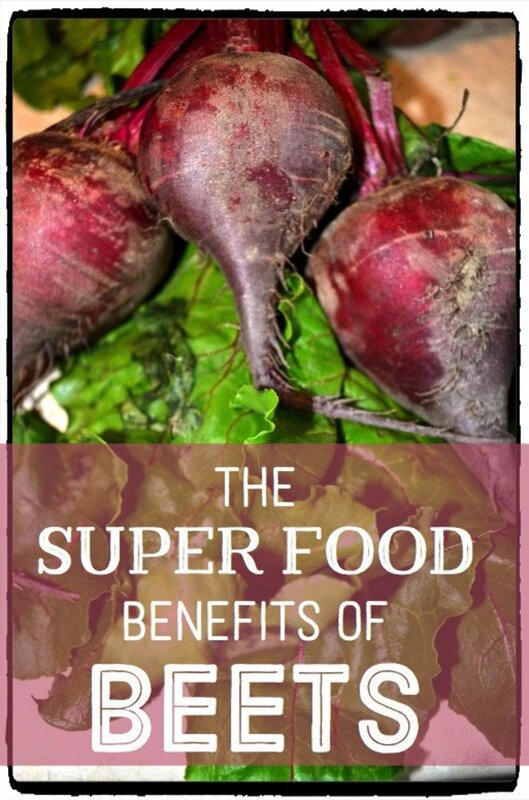 I had no idea just how many benefits there were, especially from the skin! Voted up! Wow! There's so much to learn about the pomegranate. I recently started to eat it at the insistence of a friend. I will share this information with him. Thank you very much. Voted. Wow! Who knew it could do all that? @ Hello hello,learnner 365, Lady_E, thank you for reading and appreciating. I am glad the hub has been informative in many ways to you all. Thanks for voting up and useful too. Thanks. This is very informative. I should eat more Pomegranates. Very informative Hub about Pomegranates.I am a big fan of this fruit although the peeling part is a real task to do but in the end i guess its good to enjoy the fruits of your hard work :) Thank you for sharing the wonderful information with us. A brilliantly written and very informative hub. I never knew all these benefits of Pomegranates. Thank you. @ imkd, thanks for stopping by and leaving appreciative comments. @ sankari, a warm welcome to my new reader and I'm glad you found it informative. Thanks for reading and letting me know. I appreciate it. JS, you are a lucky guy to have such a caring wife.Eat pomegranates,for her sake my friend.There are so many things we do in life that we don't want to and pomegranates surely won't hurt you. No more of philosophy my friend, I really appreciate your welcoming new hubbers in your inimitable style. I do read about it. Thanks for all the appreciation and I reciprocate it wholeheartedly. that was an informative hub!knew pomegranate has various good effects but never imagined that it has so much value! was a detailed hub! Pomegranates is the most healthy fruit. I love this fruit. Rajan, my wife wants me to eat the whole fruit (not the skin)! I know it is good for me (water, sugars, fiber...) but it is not my favorite fruit. I prefer to drink pomegranate juice mixed with something else. You are welcome for the vote and sharing. You have been a great commentor on my Hubs and I appreciate that! Great Hub! @ Sunshine, thanks for being so supportive. @ JSMatthew, thanks for reading and I think your wife knows that pomegranates are good for health and so insists that you eat them. The seeds are as nutritious as the arils if not more plus you have the added health benefit of extra fiber.Thanks for the vote UP and sharing it. @ starstream, nice to have a new reader and it is great to know that the videos were helpful. I appreciate the input. This is laid out very well with a lot of useful information. Nice job Rajan! It's funny because I am not a huge fan of pomegranates but my wife made me eat some of one today...then I came upon this Hub in the Feed! I think I enjoy the seeds the most. Nice job. Voted Up and Sharing. Another useful and yummy hub! I like pomegranates each and every way!